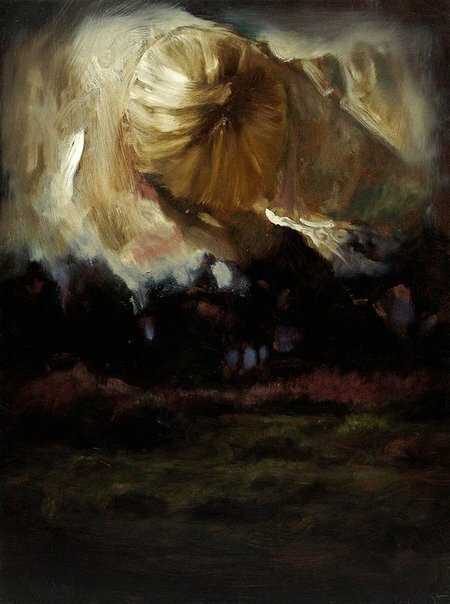 Known for her brooding, metamorphic, surreal landscapes and her gestural, semi-abstract figurative works painted with oil on masonite in the studio, Louise Hearman has much in common with the expressionist painters of the 1960s. Where she differs from them is in the foreboding tension of her surfaces, a quality more in common with artists such as Dale Frank and Bill Henson. The discontinuous space in Hearman’s paintings presents a visual paradox in its effect, now one thing then the other, constantly shifting, forcing our interpretation to slip and slide. By not titling her paintings Hearman gives no clues as to how to read them, reinforcing the element of mystery. At first glance ‘Untitled #836’ 2001 (AGNSW collection) appears to be a shrubby landscape darkened by an impending storm. Clouds meld across the sky and mingle with the branches of the gum tree to form a disembodied head of a dog that stares with a watchful eye toward us. Despite its enormous scale the animal appears passive rather than threatening, depicting the symbol of a dog as loyal and protective. In ‘Untitled #396’ the canvas is split between a dark landscape of fields and trees, the grass wildly moving as the storm brewing overhead makes its way across the expanse of sky. The storm, however, brings with it a figure rolling across the landscape as if entering our field of vision through a time warp or parallel universe, the earth lifting up to cradle the head. In ‘Untitled #395’ 1995 (AGNSW collection) a single tree is lit by an unseen light source drawing the viewer into what may commence as an innocent journey into the woods but quickly becomes sinister. A bald, dark head peers over the top of the trees and behind, a darkened, moody sky declares itself as a foreboding vision as other heads and faces appear to shift in and out in a visual aporia. There is nothing logical in these metaphysical works that grab imagery from varying dimensions of the conscious and unconscious and cause them to collide and fracture, their meaning shifting back and forth through the plane of the image. The secret lives of the figures that seem caught and imprisoned in the picture remain disturbingly elusive causing us to question if they are in fact there. They are the remnants of a dream as we slip into consciousness, an image caught in half-light, a faded memory or a glimpse into an alternate reality, such as Edgar Allan Poe’s dreams and nightmares. The vivid imagination of our childhood is recalled as we remember the possibilities of ideas, and the wonderful images conjured when reading Poe’s ‘The black cat’ or ‘A descent into the maelstrom’. Signed and dated u.c. verso, black marker "LHearman 95/ ...". Donna Brett, Contemporary: Art Gallery of New South Wales Contemporary Collection , 'Expression and the figure', pg.108-153, Sydney, 2006, 132 (colour illus.). John Forbes, Through a glass darkly , 'Louise Hearman', pg. 19-27, Sydney, 1995, 25 (colour illus. ).